A sensory-friendly version of A Christmas Carol at the Goodman Theatre offers lower sound levels, the house lights left on and the opportunity for kids to walk around as much as they please. The theatre is also providing a designated area to retreat for those that need some quiet time. Dec. 30 at 2pm. Are the holidays just too much overall? Step back and just take in a movie with your kiddo to relax without all the holiday pressure. Check out AMC's Sensory Friendly Movies and Studio Movie Grill's Sensory Friendly Movies. Or take them to a museum where they can let off some steam and not be bombarded with the holiday hustle. Try The Children's Museum, Kohl Children’s Museum or Dupage Children’s Museum, all of which have sensory-friendly days. Create a holiday tradition. 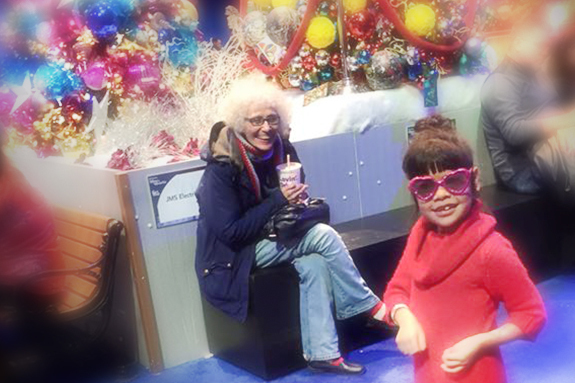 My daughter, Lia, loves the twinkling lights of the holiday displays so we pick one night put on her coziest holiday jammies and pack snacks and a thermos of hot cocoa and go for a car ride to see Sauganash's holiday lights. It’s become such a wonderful tradition in our family! For those kiddos who thrive on the excitement, like mine does, go all out and do Winter Wonderfest at Navy Pier (tons of rides and ice-skating rink) or the CTA Holiday Train or Bus! Lights, crowds and fun for all! Yes, it's complete sensory overload, but some kids really love this and then maybe you can get a great night’s sleep out of the routinely sleepless child. Check Groupon and Living Social for special offers. For both Winter Wonderfest and the CTA, mention to the employees that your kiddo is special needs so you do not have to wait in those long lines. It works—we’ve done this every year. Shopping is not always easy for our kiddos. Try to do the bulk of your shopping while they are in school, on a play dates or at family member's home. Don’t be shy to ask your family or friends for help. Like they say, it does take a village! Call in those favors now. You are going to need all the time you can get! Locally owned The Sensory Kids Store is a wonderful place to get your kiddos something extra-special online! Try to create an opportunity to get some much-needed alone time for you and your significant other. Check out Free Parents' Night Out offered by CST Academy. You can have three hours all to yourself! Be sure to register in advance. Don’t forget about yourself. All the running around making sure everyone is happy can kill anyone’s spirit. You need to make sure that you are taking care of yourself as well. Get a small treat for yourself every time you get something accomplished from your list. Get a mani/pedi, get a latte and sit down somewhere to read an article from your favorite gossip magazine, or take a few minutes to enjoy some of the beautiful holiday decorations around you. You get the idea. Breathe! And finally, the holidays are about being together and cherishing all we have. Remember to try to give back however you can by volunteering or donating to a worthy cause. Misericordia, KEEN, Easter Seals and Ronald McDonald House are just a few of the many wonderful organizations that help our special family members. There is always a need for volunteers at most organizations that give us all so much! Check out the volunteer opportunities near you. No matter how you celebrate this holiday season, I hope you all are able to enjoy your loved ones to the fullest! Evelyn Perez-Horita lives in Lincoln Square with her husband, Brian, and 8-year-old daughter, Lia. She's a full-time account manager/client care representative, co-parent and advocate, special needs entertainment blogger and local school council (LSC) board member at Beard Elementary School. In all of her spare time, she loves to hold 6am family dance parties!